The Pitfour Estate in Mintlaw was formerly one of the country's largest and best-appointed estates. The new owner of a north east estate has told STV News that he hopes to restore it to its former glory. Purchased in 1700 by James Ferguson, the estate was rapidly developed. Over the course of the 18th century a man-made lake, the lavish Pitfour House and classical Greek-imitation temples were all added. 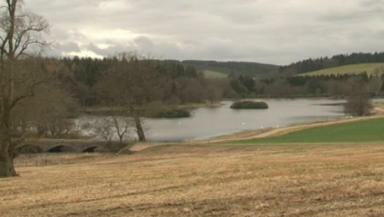 At its peak the £30m estate covered 50 square miles of Buchan. But towards the end of the 19th century Pitfour's fortunes took a turn for the worse under its final two owners. Local historian Alex Buchan explained: "They thought the estate was here to provide them with money, to gamble, to travel, to simply fritter away and very quickly, within a couple of decades, they had wasted the whole lot." "(One of the last owners) built a race track for example, so it's not just the Blenheim of the North; it's the Ascot of the North. Eccentricity amounted to just squandering money, but the same guy built the temple that you can see behind us and it is said and strongly believed that he kept alligators in it." In the 1920s, Pitfour's assets were sold off to pay the family's mounting debts. Those that remained were left to ruin. Today its history and even its whereabouts are unknown to many, even including locals. But that could change thanks to new owner Hamish Watson. Using money from the sale of plots of land on the estate, he plans to repair the temple and bridges and open the grounds up to the public. Mr Watson said: "It's probably 200 years since anything's been done on it. I've lived here all my life and farmed here all my life. It's been part of growing up really. I'd like to do it all up and everyone can get the benefit of this." Hamish has already revitalised the area by allowing a local fishing club to set up on the lake. The club now boasts over 100 members. Following a positive reaction from the local public it is now hoped work can get under way to restore the estate to its former glory by the end of the summer. Featured in the video above are historian Alex Buchan and estate owner Hamish Watson.